A farm table can be installed on its own or fitted over a kitchen island. It’s the perfect area for homework, holiday crafts, or sharing a home-cooked meal. Fireplaces can be purely decorative but you can also install a fully functional one to serve as a backup stove or heat source more so if your area is prone to power outages. Be it hanging some copper pots or using some copper canisters, the wonderful copper patina is a subdued decorating detail that brings warmth to a room. Don’t forget that brass fixtures makes for a quaint decorating detail too! Slip resistant and having a sleek looking surface in a rich hue, slate floors are easy to clean and can last a lifetime when sealed properly. Exposing some of the rugged details that’s usually hidden behind the dry wall is a sure way to add a rustic vibe to any room. It’s charming in its own way! Soapstone has been used in kitchen for centuries because it can withstand heavy use with only minimal signs of wear and tear. You’ve probably been to an older home with soapstone counters and sink. This rustic touch is an investment that will be worth your money! Whether you have a contemporary kitchen or a more traditional one, having a feature wall made of stone adds a rugged character to your kitchen without overdoing it. Try to repurpose some salvaged barn doors, beams, and shutters. You can use vintage shutters as cabinet doors, salvaged beams as an architectural detail, and barn doors as room dividers. You can even convert some old pine boards into a cute farm table with matching benches. How’s that for a rustic breakfast area? Painting your kitchen an off-white colour instantly gives it a shabby-chic vibe, more so when you distress the paint to make it look that it’s been there for quite a while. Add a few more rustic touches (see above) and you’ve got yourself a perfect country-inspired kitchen! 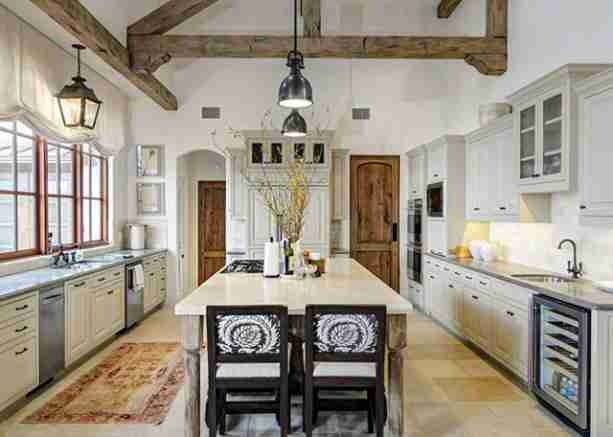 Feeling inspired to create a rustic looking kitchen with these decorating tips? Then you might get more inspired once you see the lovely available homes in Oakville! Find one that you love? Then contact us for a viewing!